I’m not a baseball fan. I’m not even a sports fan. But I am originally from the northern suburbs of Chicago, which makes me a de facto Cubs fan. And in case you (like me) aren’t really a sports fan either, you might not know about the drama unfolding in the 2016 World Series. The Cubs haven’t made it to the World Series since 1945. That’s before I was born! (Long time, friends. Long time.) They finished among the worst teams in their league year after year, becoming something of a joke in the sports world. When that happened, there was great rejoicing in the land. 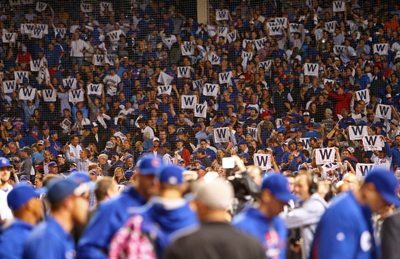 The packed-out Wrigley Field, the Cubbies’ home ball park, broke out in the “Go Cubs Go” song, and it was a transcendent experience for those who were there. But what grabbed me by the throat was seeing all the Cubs’ “W” flags. One of the losing-est teams in all of sports, with some of the most incredibly loyal fans in all of sports, finally got to really celebrate the W in Win. They didn’t even need to go all the way to win the World Series for people to go nuts with joy. It wasn’t the Cubs’ Win, though, that gave me goosebumps. The blue W on the white field reminded me that we are assured of the ultimate Win for the ultimate cosmic battle that lies ahead. The Bible provides a look into the future when good vs. evil, and Satan vs. Jesus Christ, will battle it out, and good will win. 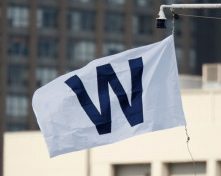 But the Cubs’ W flag represents nothing more than hope that they just might win the World Series for the first time since 1908. There is no certainty. On the other hand, the cosmic battle between good and evil has already been determined, the book has been written, and we know the ending. In the end, GOD WINS. It’s a done deal. And we who are in Christ win with Him. This blog post originally appeared at blogs.bible.org/engage/sue_bohlin/flying_the_w_flag on November 2, 2016.